If you have a backyard…. gardening tools or other outdoor gear. As a homeowner, you may have accumulated countless items that get moved from place to place around your yard. Building a storage shed is a quick and easy way to find a permanent home for all your belongings. Storage sheds come in various sizes, shapes and colors, and they provide numerous benefits to homeowners. One of the greatest advantages to having a storage shed is the extra space you can create. Instead of letting the clutter monster defeat you at the end of each day, you can reclaim your yard by neatly tucking away the chaos. You can also put away items that take up unnecessary space inside your home. Many DIY storage sheds are fully customizable, which allows you to create as much space as you need. Not only are sheds ideal for storage, they can double as small garages. If your garage has been transformed into an unorganized, muddled mess, you can eliminate the disorder by designating a shed as your hobby zone. You can tinker with projects in a more systematically structured area, which means less confusion and more efficient results. You can also turn your shed into a personal gym. Many times, gym equipment gets thrust into a garage amidst cars, lawn equipment and workbenches. This often causes a lack of motivation and results in a garage full of dusty training equipment. To get the most of your workout gear, design your shed so it will have all the features of a professional gym but on a smaller scale. A larger storage shed may be used as an extra recreation room. Adding windows or a second door will create a comfortable living space. Many prefabricated versions are designed with multiple window openings. You can also run electricity to the shed and add a television, stereo or other entertainment essentials. By constructing the shed away from the house, you can build your own private getaway. Getting organized is essential for any homeowner, and a storage shed can provide the room needed to achieve maximum tidiness. If you have ever spent hours searching for the watering can or bicycle pump, you may benefit from building a shed. The days of throwing your arms up in exasperation will be over. You can store your items on shelves or in cabinets, so you will quickly and easily find what you need at any time. With a storage shed, you can also ensure your belongings are safe. Expensive equipment can be locked away securely each night. Your items will be safeguarded from the elements as well. Wind, rain and even sunlight can destroy nearly everything you keep in your backyard. You can prevent metal equipment from rusting and keep toys from cracking by using a storage shed. The advantages to building a storage shed are endless because of the versatility it can provide. 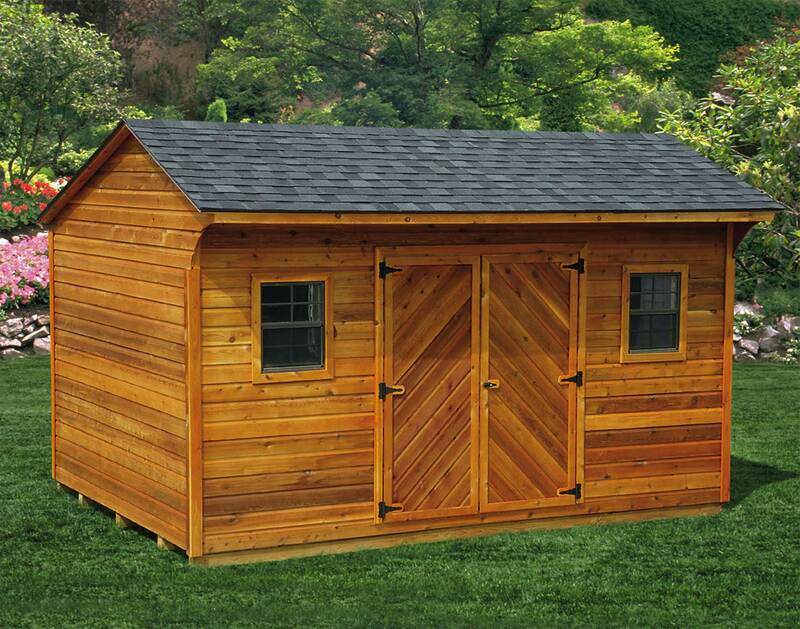 A shed adds a rustic, homey touch to any yard, and it’s functional as well. Adding a shed to your backyard may increase your property value, and it will ultimately make your neighbors happy. Many sheds are reasonably priced, and the small investment made will reap large, long-lasting rewards. Before buying or building a storage shed, it’s a good idea to check your local laws regarding this type of structure. The climate in your area as well as other factors may need to be considered before you lay down a foundation. Certain laws require homeowners to use specific types of pavers for the base of a shed. You should also consider the various wood options and select what works best for your particular environment. Whether you want a storage spot for your endless supply of outdoor items or you need a private place to hide away, a storage shed is the ideal addition for your backyard. Install It Direct can provide you with helpful tips on installing improving and beautifying your backyard. Learn more and Get Your Free Estimate Today! Join our mailing list for more information on how to create the ultimate outdoor living space.